Clay Aiken (born on November 30, 1978) is a popular American singer who rose to fame on the American Idol television program, and who has become the most successful second-place finisher in that show's history, even handily eclipsing that year's "Idol" winner in sales. His first single, "Bridge Over Troubled Water"/ "This Is The Night" debuted at Number One, and became the best-selling single of the year ? and he was just getting started. Clay's first CD, Measure of a Man (Number One, Top 200), went triple platinum selling more than 613,000 copies in its first week. Including singles like "Invisible", "The Way," "I Will Carry You" and the Neil Sedaka cover "Solitaire," it was the subject of conflicting reviews. Billboard Magazine called it the best pop album of 2003. Many fans and some critics recognized and admired the pure pop sound ("so pure it floats") and top-notch production values while others heard only a manufactured sound, noting that the singer hadn't earned his musical chops but "merely" sang his way to the hearts of millions on television, a perceived unjust leap-frogging of "the true path of the true artist." Aiken fronted a country band, Just By Chance, pre-Idol and recorded 3 demo CDs. As a young man he was a member of the Raleigh Boy's Choir and was in numerous musical productions in North Carolina Theater. The National Inclusion Project (formerly the Bubel/Aiken Foundation) was launched in 2003, supporting the integration of children with disabilities into the life environment of their non-disabled peers. In November 2004, Clay was appointed as a National Ambassador for UNICEF, with a mission to help ensure that children everywhere are afforded a primary education. In November 2004, Clay released Merry Christmas With Love (Number One, Top 200). His first Christmas album, it went platinum, won 2 Billboard Music Awards and spurred a yearly holiday tour and a follow-up EP, All Is Well - Songs for Christmas. 2004 was also the year Clay made #2 on the New York Times Best Seller List with his "inspirational memoir" titled Learning to Sing: Hearing the Music in Your Life. His next studio album, 2006's A Thousand Different Ways (Number Two, Top 200), was, through the direction of mega-producer Clive Davis, largely a covers CD. Ten of the fourteen cuts being well known melodic pop songs ranging from Richard Marx, Bryan Adams, Dolly Parton, Mister Mister, and Elton John. Two other songs, available only on digital versions of the album, are "If You Don't Know Me By Now" (through K-Mart.com) and "Lover All Alone" (through iTunes and co-written by Aiken himself). Many fans have wondered about the relative exclusion of the latter song, left languishing from the song list present on the physical CD, as its intimate emotional material and Aiken's own writing handiwork produce a spellbinding effect. In May of 2008 Aiken released On My Way Here (Number Four, Top 200), his first album of original material since his 2003 chart-topping debut Measure of A Man. While searching for songs for this album, he fell in love with a song written by OneRepublic front man Ryan "Alias" Tedder called "On My Way Here." The message of the lyrics -- how the lessons we learn while growing up shape us into who we become as adults -- struck such a deep chord with Clay that it wound up inspiring the theme (and title) of his new collection. In addition to enlisting Grammy-Award winning British songwriter and producer Kipper, On My Way Here also included the talented musicians of none other then the Steely Dan band. 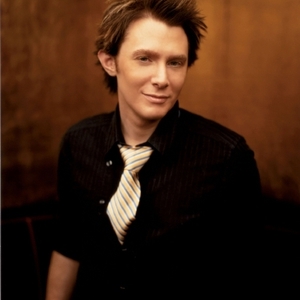 A fifth album, The Very Best of Clay Aiken, was released at the end of March 2009 on Sony's Legacy Recordings Playlist Series. To date, Aiken has headlined 8 tours., one of them co-headlining with Kelly Clarkson. Aiken made his Broadway debut playing the role of Sir Robin in Monty Python's Spamalot in January 2008. His first run ended in May. He rejoined the cast as Sir Robin in September and remained through January 4, 2009. In August of 2008 Clay became a father to Parker Foster Aiken with producer Jaymes Foster, the sister of record producer David Foster. Clay will release a brand new album, titled "Tried and True", on June 1, 2010 on the Decca Records label. Clay also has made numerous TV appearances, guest-starring on everything from Scrubs to Days of Our Lives to the season finale of the popular show 30 Rock. He has earned a place on such talk-shows as Jimmy Kimmel Live, The Tonight Show, Late Night With David Letterman, Tyra Banks, Rachel Ray, Ellen and has cooked with both Martha Stewart and Paula Deen. Though clearly, based on his television and concert appeal, a performing artist whose live presentations show consummate showmanship, bringing surprising dynamism to studio songs, Aiken has had to endure a persistent hammering from entertainment critics and a tenacious (not to say malevolent) interest on the part of some in the media relating to questions about his personal life. Always full of surprises, fans look forward to the continued ways in which this multi-talented artist expresses himself and uses his voice in ways that will expand his appeal in and beyond the US.